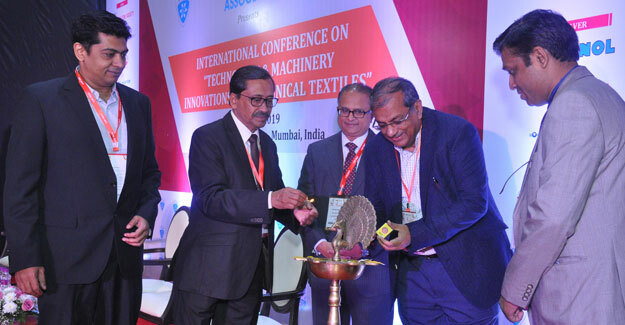 The Indian Technical Textile Association (ITTA) organized a one day international conference on “Technology & Machinery Innovations for Technical Textiles” on 19th January, 2019 at Bombay Exhibition Centre, Mumbai. This conference was timed appropriately as on January 15, both, the Ministry of Commerce & Industries, and Ministry of Textiles have recognised technical textiles as a sunrise industry and officially notified 207 products as technical textiles. These 207 HSN Codes are spread across many chapters. This will now remove confusions in the mind of the manufacturers and give a boost to investment in technical textile sector. This was possible due to the efforts put in during the last couple of years by ITTA, industry representatives and the Ministry of Textiles. The conference had 11 speakers from Germany, France and India who shared their rich experience and latest information on supply chain management, marketing challenges, innovative technology and machinery for nonwovens, woven, knitted and advanced finishes and coating technologies. Important topics at the conference were marketing challenges for technical textiles, Industry 4.0, sustainable solutions to post consumer textiles for automotive nonwovens, latest technology for needle-felted nonwovens, innovative solutions and machinery for hygiene applications, cost-effective approach to innovation in spunlace technology, warp knitting, latest technology in weaving and weaving preparatory, how to be successful with technical textiles and advance functional finishes. The conference received overwhelming response and was attended by more than 200 delegates from the technical textile industry, potential investors, students and teachers from various textile and management universities and colleges.